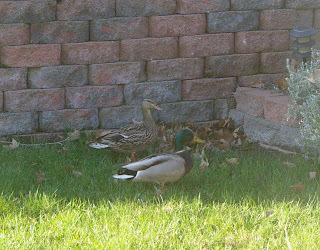 So I looked out the window today and I saw that our pet duck was back! 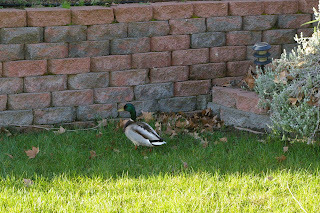 And it looks like she brought her mate this time. (If you don't know what I'm talking about, go back to our May 2008 posts.) 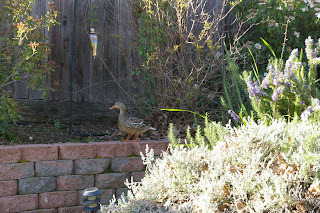 They stood there for a little bit, then Mama duck jumped in the rosemary bush for a while. 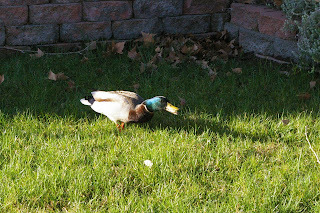 ..though he did take a quick break for a snack (Dallin threw him some bread). 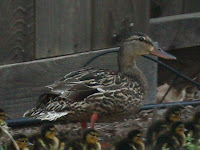 Then Mama duck emerged from the bush about 5 minutes later...and they flew away.